Like its smaller brother, the iPhone 8 Plus flaunts a premium all-glass design. It is among the first phones from its American maker offering glass on the rear. This is probably the only thing on the outside that sets it apart from its predecessor. The company claims this glass is the most durable on any phone to date. The water and dust proof device crams in a large 5.5-inch Retina HD display. The IPS touch screen actually has a resolution of 1,920 x 1,080 pixels. That’s more than 400 pixels per inch. It comes with oleophobic coating. The iPhone 8 Plus differs from the regular variant in the camera department. It offers you not one, but two 12MP sensors on the rear. The main wide-angle camera uses a six-element lens with an f/1.8 aperture. The second telephoto shooter has an aperture size of f/2.8. Camera features include phase detection autofocus (PDAF), 2X optical zoom, optical image stabilisation (OIS), and quad-LED dual tone flash. Apple promises better bokeh effect in shots. You get a 7MP front camera with Full HD video recording capability for selfies. A new in-house A11 Bionic chip provides the muscles to get things done in the iPhone 8 Plus. The six-core chipset offers better processing and graphics crunching, as one would expect. Support comes from 3 GB of RAM. Buyers can get the device in a 64GB or 256GB variant. The iPhone 8 Plus flagship comes with latest Apple iOS 11 operating system. The American tech company promises awesome augmented reality (AR) experience. Plus, audio is louder and bass deeper. You get speedy dual-band Wi-Fi 802.11 a/b/g/n/ac and Bluetooth 5.0 for wireless connectivity. There are NFC and Touch ID for Apple Pay and seamless unlocking. For the first time ever, Apple offers wireless charging support on a flagship smartphone. iPhone 8 Plus also supports fast charging. 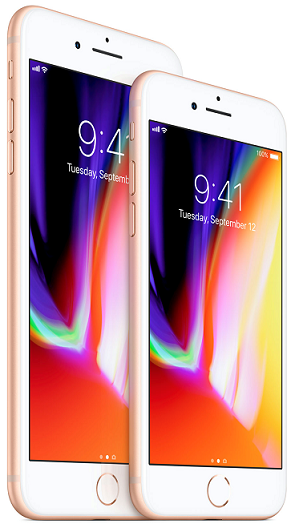 Pre-orders for the iPhone 8 Plus began on September 15, 2017, while the device hit the stores starting September 22, 2017. iPhone 8 Plus is available in 64GB and 256GB models at $799 and $949 respectively. The iPhone 8 Plus is available in Nigeria, Kenya, or Ghana. You can by the extra-large smartphone at leading online stores in your country. iPhone 8 Plus Price in Nigeria ranges from 220,000 Naira to 550,000 Naira, depending on your location and built-in storage. Price in Ghana is expected to start at around 3,200 GH₵. iPhone 8 Plus Price in Kenya is expected to start at around 78,999 KSh.